Simplicent LLC has today released the first version of Learn Pro Blackjack, for iPhone and iPad. This blackjack training app, built for Simplicent by Rectangular Software, teaches users the fundamentals of Basic Strategy – the essential knowledge for maximising your chances of winning at the table. With a typical house edge of around just 0.5%, blackjack is a far better proposition for the discerning player than other casino games such as roulette, but only if you make the right decisions in your play. Basic Strategy is a proven set of rules that determine what you should do in every possible situation to give yourself the best chance of winning. Learn Pro Blackjack combines a set of training flashcards with a comprehensive strategy test consisting of 340 scenarios. The app supports both Las Vegas and Atlantic City rules and includes additional tips to help you get the most from your gaming experience. If you want to learn blackjack strategy, the app is available now from the iTunes App Store. Some interesting figures were published by mobile app analytics firm Flurry recently. They show how Google Play (the new name for Android Market) is trailing a long way behind its major competitors in generating per-user revenue from smartphone apps (an app on the iTunes App Store earns over four times as much per user). The that fact apps on the iTunes App Store generate more money than equivalent apps on Google Play is not news but what is interesting in these figures is that Amazon has no such problems making money from Android apps. The comparison between Google and Amazon is not entirely like-for-like since Amazon’s store is US-only at present and has less than 10% of the titles that Google has. The difference in performance is striking nonetheless and perhaps explains the recent Google Play rebranding that positions Google’s app store as a more direct competitor to Amazon’s digital content store. Google also reportedly has the Kindle Fire in its sights with its own 7-inch Android tablet in the works. 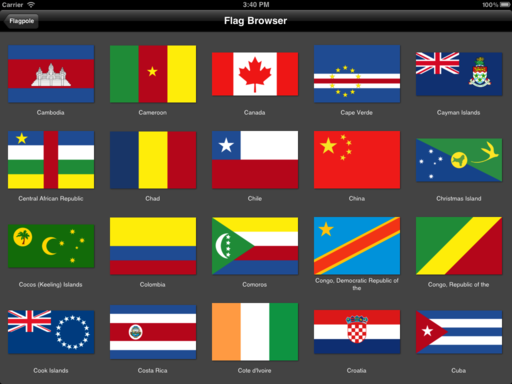 Having previously added tablet support to the Android version of the educational flag recognition game Flagpole, we’ve now brought the iOS version up to speed with proper iPad support (including support for landscape orientations). This new version (version 1.3) is available on the App Store now. When considering building a smartphone app for your business, it is important to understand the nature of your target audience. The landscape changes rapidly and differs from country to country. There are multiple mostly incompatible smartphone platforms battling for supremacy, constantly gaining or losing market share. Yesterday’s top dog might be tomorrow’s has been. A glut of surveys are published throughout the year that attempt to provide an overview of the current state of the smartphone world but often they just end up adding to the confusion. I lost count of how many separate occasions Android was reported to have overtaken the iPhone in the last year. The problem is that the surveys often measure different things in different ways. Some count only new activations while others monitor total device ownership. Sometimes they can’t even agree on the definition of a smartphone and, even if they can, the data presented in one survey is often from a different territory to the data in another survey. Any surveys that you consult have to be interpreted carefully if you are going to use them as the basis for important decisions such as which platform(s) to prioritise. The first question to consider is where are your target audience? If your business is constrained by geography then you’re only really interested in local statistics, for instance those for the UK. Alternatively, if you aim to reach the entire English-speaking world then the data for the much bigger US market is more significant. And if you intend to engage in multiple languages across the world then you should be looking at global data. Secondly, while surveys based on the number of new activations provide a good indication of where the market is heading, they don’t tell you how many users each platform has right now. Many users are tied into 18-month or 24-month contracts with mobile operators. They are still potential users of your app but they don’t show up in the new activations surveys because they are not buying new devices. With all this in mind, I wanted to highlight a couple of surveys that have been published in the past week that provide a useful snapshot of where things stand right now (as of the end of the third quarter of 2011). The first is from Kantar Worldpanel ComTech and covers Great Britain. It shows that 43.8% of the population now owns a smartphone (and this is increasing significantly with 69.1% of new phones sold being smartphones). Half (49.9%) of British smartphones run Android, a phenomenal increase over the last 18 months. RIM’s Blackberries (22.5%) are in second place ahead of Apple’s iPhones (18.5%), suggesting that the oft-predicted demise of the Canadian manufacturer is yet to materialise in the UK. Microsoft’s Windows phones have been almost completely ignored by British buyers so far. The second survey, from Nielsen, provides an equivalent view of the US market. The ratio of smartphones to non-smartphones (43% vs. 57%) is almost identical. Android is number one in America too but not quite as dominant with a stronger showing from Apple pushing RIM into third place. Microsoft has at least registered on the other side of the Atlantic but is still a distant fourth. The broad similarity of the UK and US figures might lead you to assume that the picture is the same across the world. That’s not the case and if you plan to target other countries you should strive to determine the local situation. As an example, in parts of Asia the popularity of Android is even higher, driven in part by loyalty to home-grown brands. For instance, figures from the previous quarter show 85% Android penetration in South Korea, home to Samsung and LG, and 71% in Taiwan where HTC is based. There are many important milestones in the early life of a new country. The declaration of independence, diplomatic recognition from other states, and membership of the United Nations to name just a few. South Sudan is the world’s newest country. It gained independence on July 9th this year and joined the United Nations five days later, but until now it has lacked the prestige of an entry in Rectangular Software’s Flagpole mobile app. 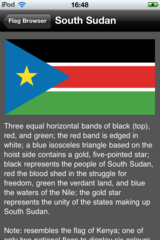 South Sudan becomes the 234th flag to feature in our educational game for Android and iPhone. The updated Android app is available now on the Android Market. The iPhone update has been submitted to the App Store and should be available soon. Also included in these versions is the change of Libya’s flag back to the pre-Gaddafi red, black and green design.